Fendi round optical frames in acetate. Pearlescent bead trim at frame front. Celine cat-eye optical frames in acetate. Lens/bridge/temple (in mm): 50-16-145. Clear, non-optical demo lenses (replacement recommended). Logo detail at arms. Celine cat-eye optical frames in acetate. Lens/bridge/temple (in mm): 50-16-145. Clear, non-optical demo lenses (replacement recommended). Logo detail at arms. Made in Italy. Proposition 65 WARNING: Sunglasses contain bisphenol A (BPA), a chemical known to the State of California to cause birth defects or other reproductive harm. 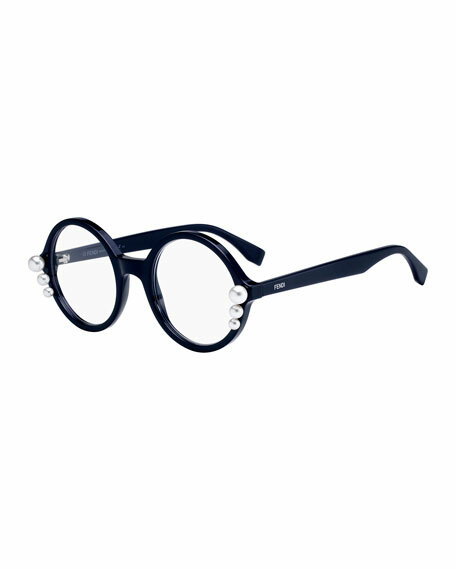 Celine butterfly optical frames in acetate. Clear, non-optical demo lenses (replacement recommended). Logo detail at temples. Made in Italy. Proposition 65 WARNING: Sunglasses contain bisphenol A (BPA), a chemical known to the State of California to cause birth defects or other reproductive harm. FRAME striped linen dress. Elasticized, off-the-shoulder neckline. Short sleeves. Self-tie belt. Shift silhouette. Slipover style. Knee-length. Imported. Model's measurements: Height 5'10"/177cm, bust 33"/84cm, waist 25.6"/65.2cm, hips 35.8"/91cm, dress size US 2-4/FR 34-36.